Over a year has passed since Denver voters stepped up and approved bond and mill levy funding measures that support critical school improvements and program initiatives. We have been busy this past year and are excited to share our progress. 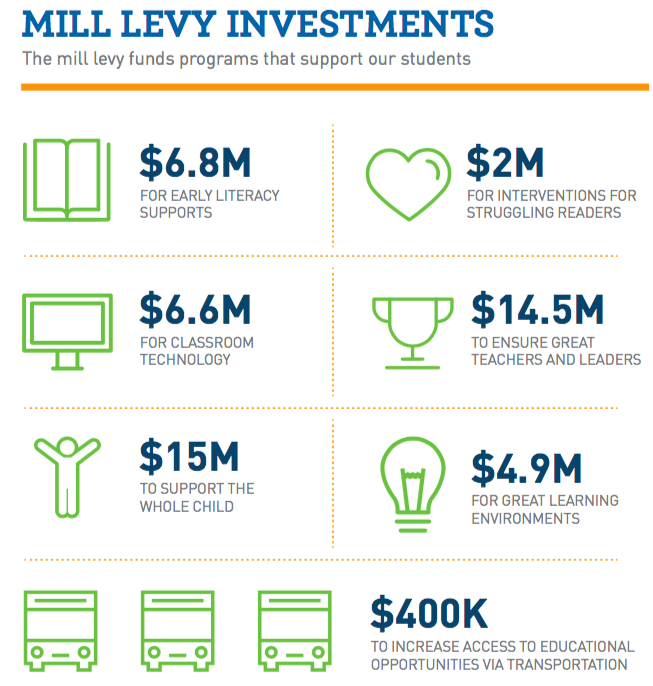 From new buildings, air conditioning and classrooms to expanded early literacy initiatives and educator development, the funds from the bond and mill levy are helping us create great schools in every neighborhood, ensuring Every Child Succeeds. $209 million of $572 million bond dollars invested. Installed two turf fields for sports. Completed work on creating innovative classrooms at 33 schools. Selected 14 schools to participate in the MyTech program, distributing over 7,000 laptops to students for use at school and to take home. Invested $100 in technology purchases for every DPS student. $15 million to support the whole child by providing schools flexible funds to hire additional support staff or expand social-emotional learning programs. $14.5 million to ensure great teachers in every classroom, and great leaders in every school through the expansion of the Teacher Leadership and Collaboration model and Paraprofessional-to-Teacher training program. $8 million for college and career readiness opportunities, including expanding participation of our Career Connect Programs. $6.8 million for early literacy supports by building educator expertise in instruction and $2 million for evidence-based interventions for struggling readers. $6.6 million to increase classroom technology. $4.9 million for great learning environments. $400,000 to increase access to educational opportunities through transportation options. These investments for our students would not be possible without the support of the community. Denver taxpayers trust us to do what is best for our students, and we take that responsibility seriously. As we continue to invest in capital projects and in-school programs, we are committed to sharing our progress with the public. We have a lot of exciting work ahead of us in 2018, so check back often for the latest developments.